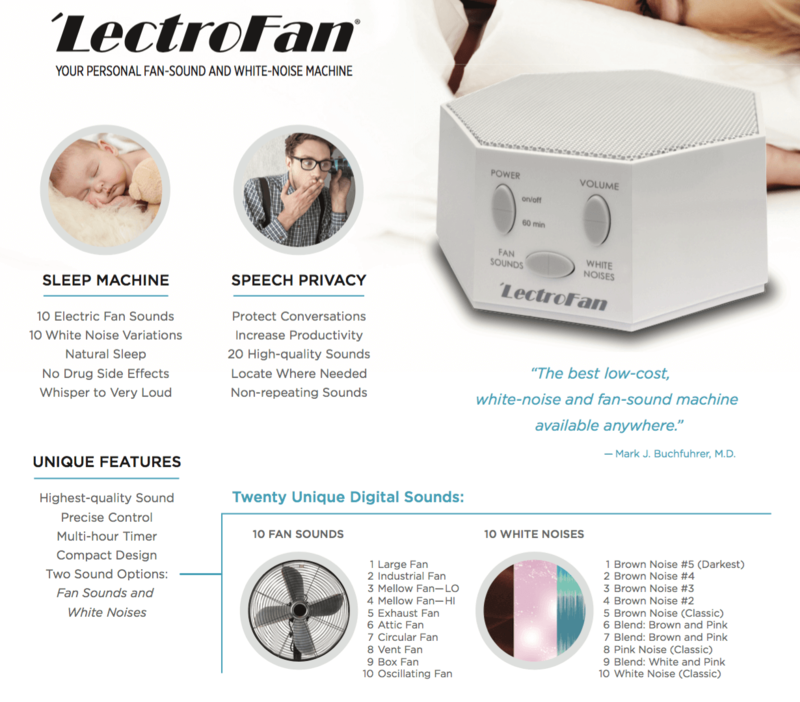 LectroFan uses state of the art technology to create dynamic sounds to drown out unwanted or disturbing noises. 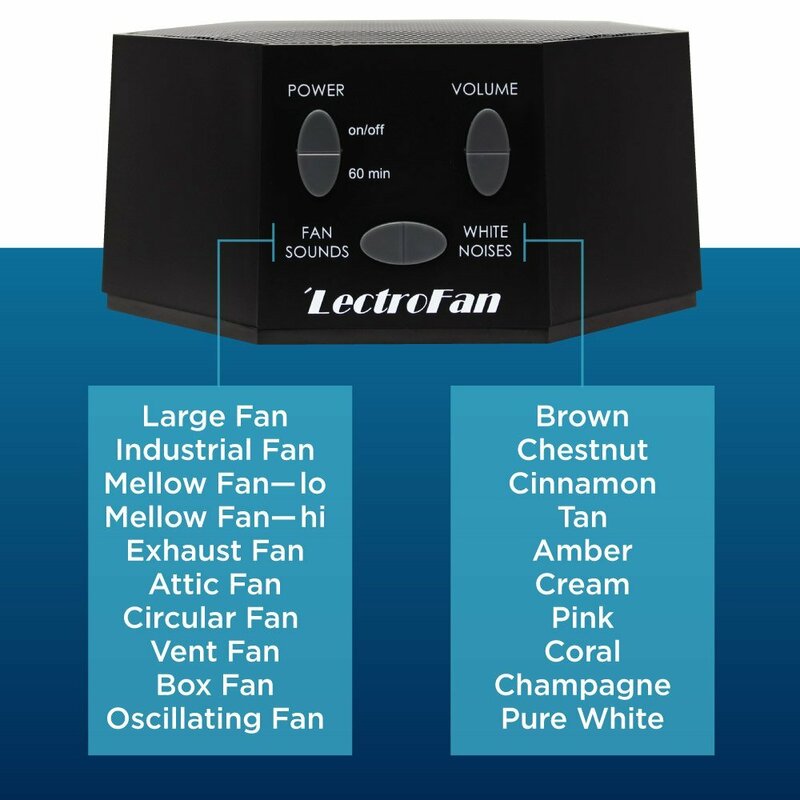 LectroFan provides two ways to reduce unwanted noises; either fan or white noise sounds with each of them able to run on 10 unique, non-repeating sound variations. 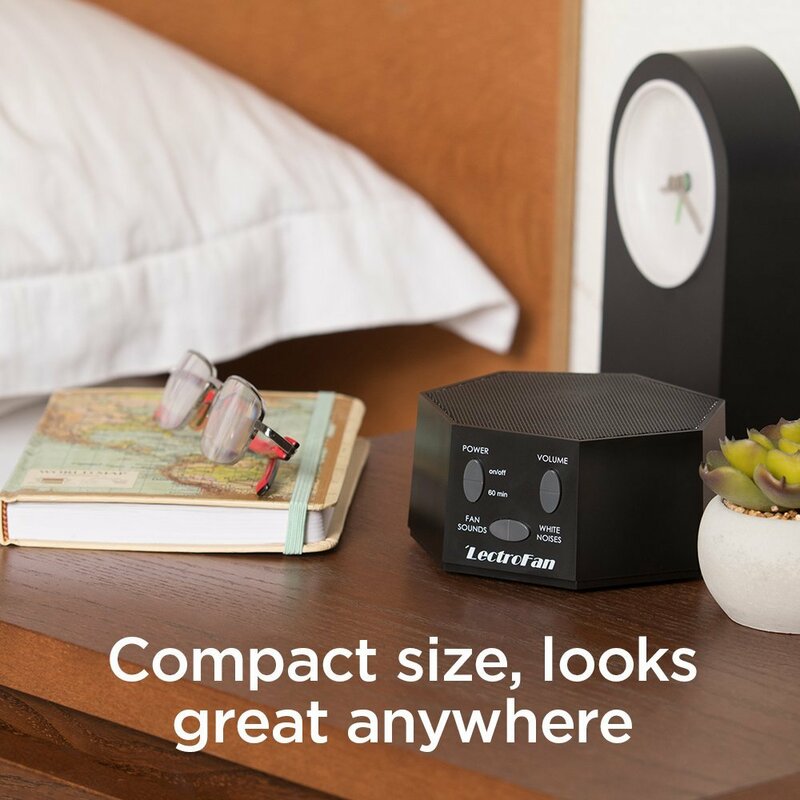 LectroFan works great for speech privacy, uninterrupted sleep, blocking out noisy neighbors, drowning out snoring, reducing tinnitus ringing or hissing, and helps to create a more relaxing environment for yoga and/or meditation. State of the art technology that generate dynamic sounds to mask unwanted or disturbing noises. 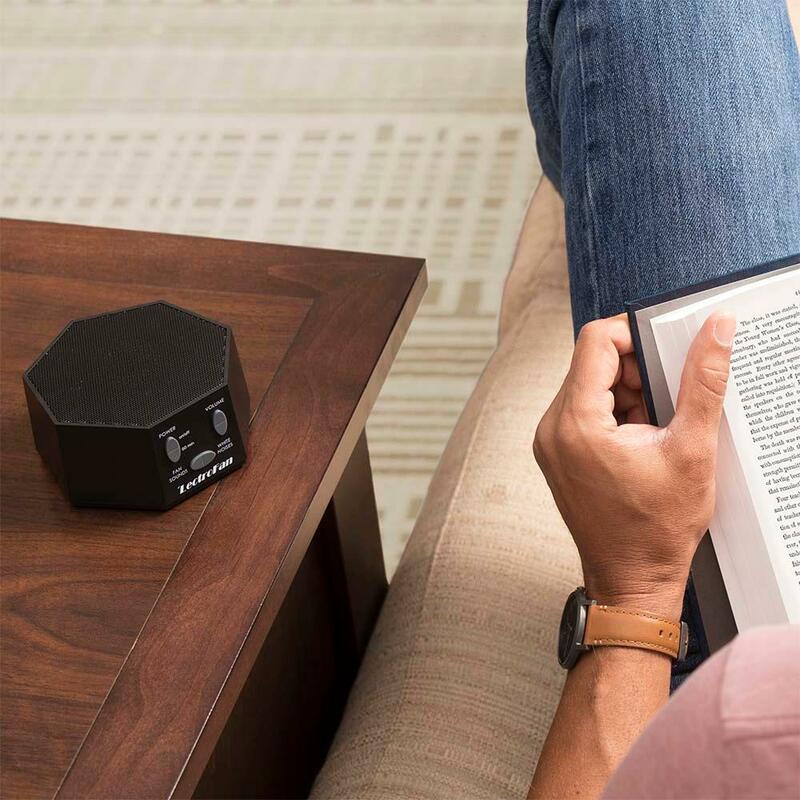 Equipped with two ways to reduce unwanted noises; either fan or white noise sounds. 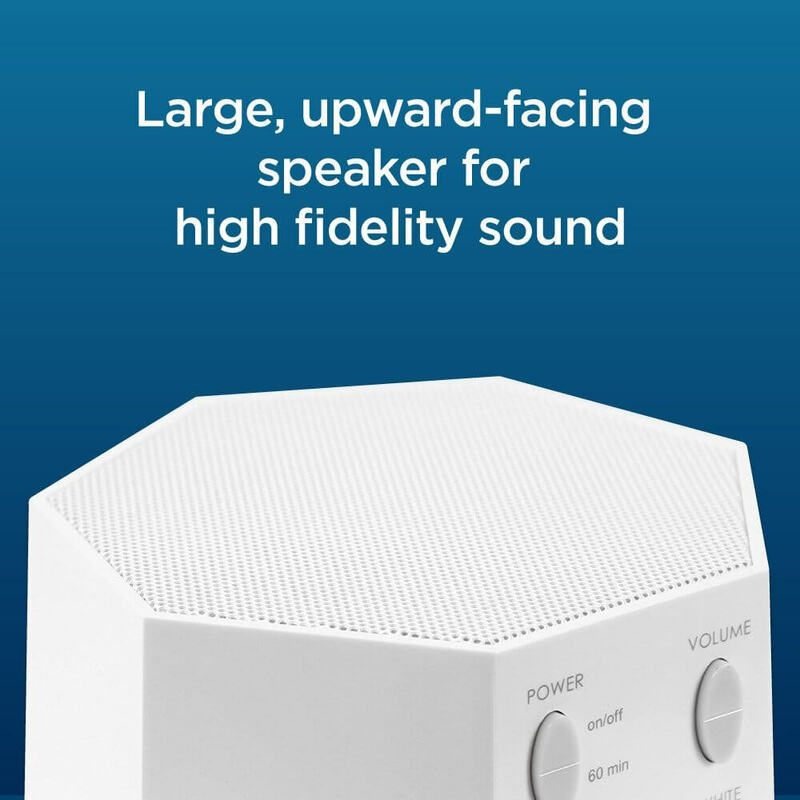 Both ways run on 10 unique, non-repeating sound variations, each with adjustable volume control. Fan sounds are great for creaky floor boards and loud parties while White noise sounds work well for deep bass, tinnitus, and traffic. Weighing at under 14 ounces, it is designed to be highly portable. With a modern design, it blends well with house decor. It can be operated using laptops, AC adapters and any USB outlet. It is efficient and does not contain any moving parts. Thus, you will never replace motors or clean the fan blades. Typically, fans require up to 0.07 KWH to operate, while LectroFan only runs at 0.002 KWH. Make your payment directly into our bank account either via PayNow, OCBC Pay Anyone or instant interbank transfer (choose immediate/FAST transfer). Please use your Order ID as the payment reference. Your order is only confirmed after payment is made and received. 1.1 Any Order sent to Dropnoise (“the Seller”) by the customer for the supply of the Seller’s products (“the Products”) will be accepted entirely at the discretion of the Seller and if so accepted will only be accepted upon these conditions (“the Conditions”) and by means of the Seller’s standard order verification form. 1.2 Each Order which is so accepted shall constitute an individually legally binding contract (“the Contract,’) between the Seller and the customer. 1.3 These Conditions shall override any contrary different or additional terms or conditions (if any) contained on or referred to in an order form or other documents or correspondence from the customer and no addition or alteration or substitution of these terms will bind the Seller or form part of any Contract unless they are expressly accepted in writing by a person authorised to sign on the Seller’s behalf. 1.4 The customer acknowledges that it has not been induced to enter into the Contract by any representation made by or on behalf of the Seller other than those contained in the Contract. Contracts are irrevocable and unconditional without the written consent of the Seller and Contracts resulting from special orders may not be cancelled in any circumstances. No variation of any Contract shall be valid and binding unless the terms thereof have been agreed in writing by both the Seller and the customer. 4.1 Customers will be invoiced by the Seller at the Seller’s prices ruling at the date of despatch of the Products. 4.3 Seller reserves the right to terminate the Contracts, in the event that a Product has been mispriced in the Seller’s quotations, pricelists or on the Online Sales Platform, in which event Seller shall notify you of such cancellation by giving three days’ notice. The Seller shall have such right to terminate such Contract whether or not Products have been dispatched or are in transit and whether payment has been charged to you. 5.1 All Products will be supplied to the Seller’s specifications current at the date the manufacture of the Products starts. 5.2 Products will be made from the Seller’s standard materials but, if, for any reason, such materials are unavailable, the Seller reserves the right to substitute the most suitable alternative that can be obtained at the time of manufacture. 5.3 All dimensions, sizes, capacities and graphic representations are approximate and subject to variation and change by the Seller without notice. Critical features must be agreed in advance of placing an order. 5.4 No other specification, descriptive material, written or oral representation, correspondence or statement, promotional or sales literature shall form part of or be incorporated by reference into the Contract. Where the Seller supplies Products to a customer in accordance with the customer’s specification, any addition or alteration shall be subject to an extra charge and the customer shall indemnify the Seller against all damages, penalties, costs and expenses to which it may become liable through the infringement of the rights of third parties. 7.2 Orders made by telephone must be confirmed in writing by the customer within 48 hours on order forms marked “Confirmation of telephone order”. 8.2 Where Products are delivered by instalments each delivery shall be deemed to constitute a separate enforceable Contract and will be invoiced by the Seller separately. 9.1 All Products supplied by the Seller will be delivered to the customer at the place of delivery. 9.2 You acknowledge that delivery of the Products is subject to availability of the Products. All delivery timeframes given are estimates only and delays can occur. The time for delivery shall not be of the essence, and the Seller (nor any of its agents) shall not be liable for any delay in delivery howsoever caused. If the customer fails to take or accept delivery of the Products in accordance with Condition 9 hereof the price shall nevertheless be paid in accordance with Condition 16 as if delivery had taken place. The Seller shall be entitled to charge the customer for storage, insurance and other expenses reasonably incurred or suffered by the Seller as a result of such failure but the Seller shall not be bound to take any steps for the custody or care of the Products or be liable for any loss or damage suffered by the customer arising there from. Any times quoted for delivery are to be treated as estimates only and will not involve the Seller in any liability for failure to deliver the Products within such time. Where for any reasons delivery of the Products to the customer is delayed the customer shall take delivery of the Products sold within 3 days of being so requested by the Seller. The Seller shall not be liable for failure to comply with the terms of the Contract if it is prevented from so doing through any circumstances beyond its control, including but not limited to Act of God, force majeure, strikes, lockouts, accidents, war, fire, reductions in or breakdown of plant or machinery or shortage or unavailability of raw materials from normal sources or routes of supply. 14.2 Any repaired or replaced Products shall be redelivered by the Seller free of charge to the original place of delivery but otherwise in accordance with and subject to these Conditions save that the warranty period (referred to in Condition 14.1) shall be replaced by the unexpired portion of that period only. 14.3 The Seller shall be under no liability whatsoever in respect of any defect in the Products arising after the expiry of the applicable Product Warranty, if any. 14.4 The Buyer shall register your purchased products within three days of receiving them for warranty coverage at Dropnoise Website or via email to hello@noisyneighboursingapore.com, if applicable. Failure to do so, Seller may deem the warranty for the item to be invalid. 15.2 Where the customer is a consumer nothing in these Conditions shall affect his statutory rights. 16.1 Except where a credit account has been opened for the customer by the Seller, payment shall be made in advance against a pro-forma invoice. 16.2 Credit account invoices are due for payment within thirty days of the date of invoice. All invoices are strictly net. 16.3 Payment of credit account invoices by their due date is a condition precedent to the fulfilment of the Seller’s further obligations under the Contract in respect of which such default has been made or any other Contract then subsisting between the Seller and the customer. 16.4 The Seller shall have the right to charge interest at the rate of 2% per month and will be charged on a daily basis on overdue accounts calculated from the date payment is due until receipt of the payment at the Seller’s offices. 17.1 The risk in the Products supplied by the Seller shall pass to the customer at the time of delivery or if the customer wrongfully fails to take delivery of the Goods, the time when the Seller has tendered delivery of the Goods. 17.2 Notwithstanding delivery and the passing of risk in the Goods or any other provision of these Conditions the property in the Goods shall not pass to the customer until the Seller has received in cash or cleared funds payment in full of the price of the Goods and all other goods agreed to be sold by the Seller to the customer for which payment is then due. Until such time as the property in the Goods passes to the customer, the customer shall hold the Goods as the Seller’s fiduciary agent and bailee and shall keep the Goods separate from those of the customer. b) if the customer has parted with possession with the Product by way of sale having sold them as fiduciary bailee shall hold in trust so much in the proceeds of sale of the Products as represent the customer’s liability to the Seller in respect of them. 17.4 If any of the Products are processed into other goods before payment in full for the Products has been received by the Seller, the customer shall hold the Products and such other goods on trust for the Seller until such payment is made and the customer shall hold in trust for the Seller so much of the proceeds of sale of the Products and such other goods and any rights arising from sale as are equivalent to the unpaid price. 17.5 The Seller may for the purpose of recovery of its Products enter upon any premises where they are stored or where they are reasonably thought to be stored and may repossess the same. The customer shall not assign or otherwise dispose of this Contract without the Seller’s prior written consent. The Seller shall have the right to terminate the Contract forthwith by notice in writing where the customer becomes insolvent or bankrupt or makes an arrangement with its creditors or suffers a receiver to be appointed or being a body corporate enters into liquidation (other than in connection with a reconstruction or amalgamation) in any of which case the Seller shall have no further obligations under the Contract and the price for all the Products delivered shall become immediately due and payable. Contracts made with the Seller shall be governed by and construed according to the laws of the Republic of Singapore and the customer agrees to submit to the jurisdiction of the Republic of Singapore Courts.